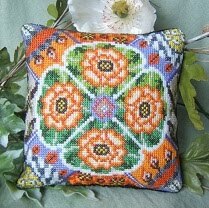 I've launched my new cross stitch kit in my webshop today. This one is called 'Oriental Poppies' and features cream coloured poppies edged with the brightest of orange! I've been wanting to stitch a design using orange threads for a while now as I rarely use the colour - unless stitching oranges of course! I love the bright greens against this orange too. I had been thinking about designing a larger, full-size cushion but then by the time I would have charted it and stitched it I could have completed 3 mini ones so I'm sticking with my specialty of mini cushions for now! I've still got a lot of ideas for designs so I should be able to keep going with them for some time yet! I'm looking forward to issue 200 of Cross Stitch Collection as I've got a nice little ad in the stitchy websites section, so I hope that will raise some more interest from readers. Hello from upstate New York! Just found your blog, but I've owned Mini Cushions in Cross Stitch for about a year, and have completed both "Poppy Precious" and "Winter Breeze." They are both matted, framed, and adorning my wall. I love your designs--it is so hard to find modern, geometric patterns for cross stitch, and the way you use color is amazing! I enjoy the small format of the projects, and they are genuinely fun to work on. Every time a friend or family member sees your completed work, they are completely blown away. Keep up the good work!